For that trip, Marquis lined up her first sponsor, the North Face. She doesn’t think she impressed the company by her pitch. She believes it gave her a few backpacks, a couple of tents and some clothes because, she said, “when I told them what I was going to do, they thought, We can’t let that little thing go out without gear.” To supplement the inadequate supply of noodles she could carry, Marquis brought a slingshot, a blow gun, some wire to make snares and a net for catching insects. In the warm months, Marquis ate goannas, geckos and bearded dragons. In the cold months, when the reptiles hid, she subsisted on an Aboriginal standby, witchetty grubs — white, caterpillar-size moth larvae that live in the roots of Mulga trees. (Raw, Marquis said, they taste like unsweetened condensed milk; seared in hot sand, they crisp up nicely.) Throughout, Marquis tried to minimize human contact. She hid her femininity with loose clothes, big sunglasses, hair piled up in a hat. When water was scarce, she collected condensation, either by digging a deep hole and lining the cool bottom with plastic or by tying a tarp around a bush. If those techniques didn’t yield enough liquid — and they rarely did — she drank snake blood. 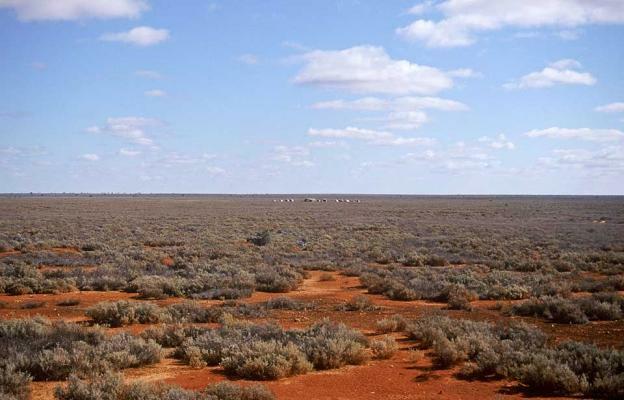 At night Marquis slept close to the trunks of trees, touching the bark in a way that she describes as “almost carnal.” She fell in love with a particular twisted and wind-bent Western myall tree on Australia’s Nullarbor Plain. that’s a highly populated stretch. 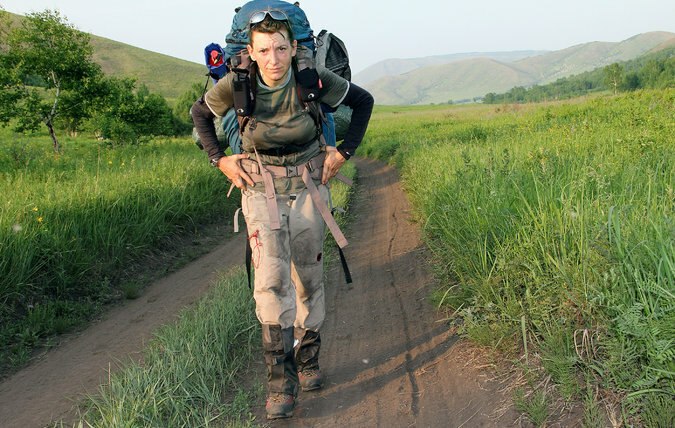 A self-portrait that Sarah Marquis took (her camera was on a cart filled with gear) north of Mongolia, during the first month of her trek across Asia and Australia. Umm…………………………….. hasn’t she heard of Uber?